We might consider the battle strategy that God gave Moses to defeat Amalek a little strange. There was an army and a captain (Joshua) naturally enough, but there were also onlookers. The main one was their leader, Moses, observing the battle from a hilltop. He had his arms raised to heaven. As long as he kept them up, the Israelite army prevailed. But when his arms got tired and he lowered them, Amalek prevailed. So Aaron and Hur stood on either side of him and helped him keep his arms raised. By the end of the day, using these tactics, Joshua and the army below defeated Amalek. I see this as a picture of how we need to fight our day-to-day battles. They are also waged on two levels—the actual battleground of our life or church, or school, or community and in the spiritual realm. Moses with his hands raised is a picture of our dependence on God. Moses is the personification, here, of prayer which should accompany each earthly battle of ours as well, from the war against our own sinful nature to the battle against the forces of evil and darkness in our families, churches, communities, countries, and the world. Aaron and Hur are the intercessors—the pray-ers who help us to pray without ceasing, who keep our hands of prayer raised when we become too tired to keep them up on our own. Israel’s battle went on for the whole day. It wasn’t until sunset that Israel left the battlefield victorious. 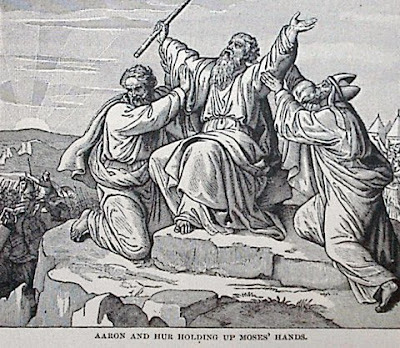 Joshua and Hur stayed with Moses and kept his arms raised for the duration. We’d like our battles and those of our friends’ to be won and over in an instant. But that’s not how it works most of the time. Do we stick it out till the final victory in our own battles and in our intercession for others? PRAYER: Dear Father, thank You for this picture of prayer. Help me to be faithful and persevering in prayer for the battles I face and in holding up the arms of others in intercession. Amen.